Rainbow Lorikeets come to town! Little flocks of colour dart overhead and the air chatters with a sense of playfulness and joy. The Rainbow Lorikeets have moved into town - and these little funsters can’t help but demand our attention! The Lorikeets have arrived with only one thing on their mind - food! Sweet food. Lorikeets belong to the parrot family, but unlike most parrots, who feed off seeds and fruits, Lorikeets prefer nectar and pollen, more like the honey-eaters do. They are known as blossom-feeders, and have a brush-like appendage at the tip of their tongue to help to probe and soak up food from flowers. Early each morning they fly from their roost (where there can be groups of several hundred) in search of food. They hang about in their food trees all day and following a late arvo feed, fly back to the roost for some shut eye. So what is it that the Rainbow Lorikeets have come to town for? Most delicious to these birds right now are our winter native flowers - in particular the Banksias and Melaleucas. Our Coastal Banksias have been in flower for a month or so, and the Melaleucas (Broad-leaved Paperbarks) have, as they do, just suddenly popped profusely! An early morning or late arvo visit to Lake Ainsworth, where both of these species are abundant, is a must if you want to see these birds in mass. The place has been alive with colour and chatter - but don’t wait too long - Rainbows Lorikeets are nomadic and once they’re done with our flowers they’ll be off in search of more food elsewhere. Rainbows aren’t the only type of Lorikeet we see here - we also get Little Lorikeets, Musk Lorikeets and Scaly-breasted Lorikeets. If amongst a flock you notice different colour patterns between the birds, it’s likely that you’re observing a different species, rather than a female or male version (who in these species look pretty much the same). 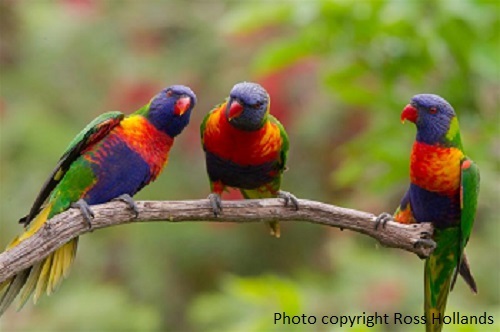 It’s also not uncommon for different species of Lorikeets to join up with a flock of Rainbows. I know they're cute but it's important not to feed Lorikeets, especially not seeds - it’s not their natural food and can damage their beaks and special tongues. The best way to encourage Lorikeets to visit you is to provide some natural food in your garden. Local Banksias and Melaleucas are obviously a good choice - but it’s worth asking for more options at a good native nursery. Remember to ask for a ‘local native’ species - they’re likely to grow easier and support more of the local wildlife. So until next month.. enjoy the little birds and our winter native flowers - word on the street is that the first of the humpbacks have made a splash - no doubt they’ll soon be stealing the show - and dragging our attention to the ocean once more. Want to learn more about our local birds? Get in touch with one of the three great local bird groups - Byron Bird Buddies, Brunswick Valley Bird Watchers or BirdLife Northern Rivers.